During any given Kibana browser session, the data requests are forwarded to Elasticsearch, some other calls are done by the Kibana server process. The username and password you set in kibana.yml as per our plugin installation instructions, will be used by the kibana server process. The browser will need to provide their own basic auth credentials. So to answer your question, a user will log in using their browser’s default basic auth prompt when browsing Kibana (without our non-free Kibana plugin). It’s going to be a less than smooth experience because there won’t be a logout button and some Kibana apps will show errors. Thank you! I already tested and worked! 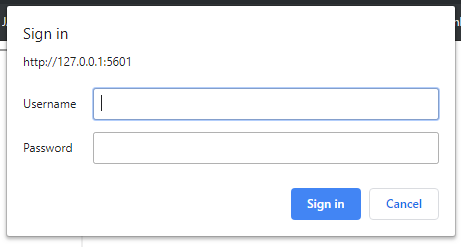 I am trying to embed the dashboards, there is a way to insert the credentials in iframe to skip this login? Have you tried with embedding the creds in the url? Yes, using this strategy the iframe does not work. OK if that doesn’t work, then the only (and better) option is JWT deep linking, we have a customer who heavily uses this. However ROR PRO/Enterprise is required.